"We’re proud that this year’s Indianapolis 500 will showcase the new 505-horsepower Corvette Z06 and honored that it will be driven by another racing icon—Lance Armstrong," said Ed Peper, Chevrolet General Manager. "The 2006 Corvette Z06 is infused with technology from our own endurance racer—the four-time Le Mans winning C6.R Corvette race car—and having it play such a key role at this important event acknowledges the significance the vehicle has played in American culture for more than 50 years." As the No. 1-ranked cyclist in the world in 1996, Armstrong competed as a member of the U.S. Cycling Team in the Summer Olympic Games. While seemingly at the top of his game, he was literally forced off his bike because of cancer. He formed the Lance Armstrong Foundation within months of his diagnosis to help others with their cancer struggles. Armstrong then staged an incredible comeback, winning his first Tour de France title in 1999. After seven consecutive victories, Armstrong retired following the 2005 race and continues to be a leader and activist on behalf of cancer survivors around the world. The Lance Armstrong Foundation has become among the most influential organizations of its kind and provides practical information and tools people need to battle cancer and live strong through education, advocacy, public health programs and research grants. The Indianapolis Motor Speedway has been the site of many memorable events since the facility opened in 1909. Similarly, Chevrolet has a rich heritage in racing that dates to company co-founder and namesake Louis Chevrolet, a gifted engineer and talented race car driver who competed in the Indianapolis 500 four times. 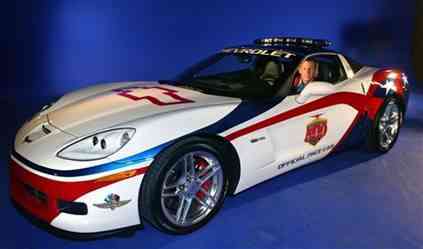 The 2006 Corvette Z06 that will serve as the Indy 500 pace car is virtually identical to the models available today through local Chevrolet dealerships. Because the production Corvette is so racing-ready with 505 horsepower capable of 198 mph and a 0-60 mph time of 3.7 seconds, sophisticated aerodynamics, a suspension that can handle 1.01 Gs in cornering situations and large 18-inch front and 19-inch rear wheels that are a foot wide in the rear, the only changes made to prepare it for this year’s role were the addition of strobe lights and racing safety gear. Like race cars, the duties of a pace car can be long and strenuous. During the last four Indy 500 races, for example, the Chevy pace vehicles led the field for a combined 186 laps (465 miles) of the total 800 race laps (2,000 miles). Even during green-flag race conditions, the pace cars patiently run at idle ready for action at a moment’s notice. 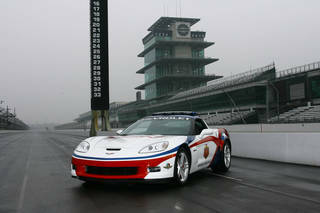 With the Indianapolis 500 being such a classic American race during Memorial Day Weekend and with Chevy’s “An American Revolution” campaign, the Corvette Z06 pace car features an Americana red, white and blue theme. It displays an abstract U.S. flag pattern with “Victory Red” and “Cobalt Blue” ribbons flowing across the car on a base of “Arctic White” with white stars flanking each side. The 2006 Indy 500 logo is on each door, and the Chevy red racing Bowtie appears at the top of the hood. The race will be broadcast live on May 28 by ABC Sports and the IMS Radio Network. The green flag drops at 1 p.m. EDT. Tickets are available for the 2006 Indianapolis 500. For information, log on to www.indianapolismotorspeedway.com or call the IMS office at 800-822-INDY or 317-492-6700.